Spider veins are superficial veins of red, blue, or purple in color that can appear as a star shaped pattern of clusters or as branches of fine lines. Most commonly found in the legs and face, these veins are harmless and are not associated with symptoms, however the condition can be a major source of embarrassment for many females. Spider veins are not to be confused with Varicose Veins, which are larger twisted appearing veins that require a different treatment modality. When you feel that they present as a “sign of aging” that you would like to eliminate. Most candidates are those that are in good health, do not smoke, and have realistic expectations. Spider vein treatments are a quick, safe, and effective treatment with minimal side effects. 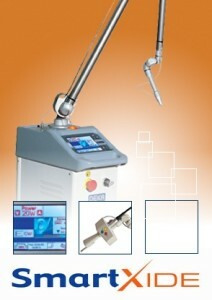 Using the Deka ND YAG laser attachment, a precise beam of light is targeted to the spider vein. As the vein’s pigment color attracts the laser beam, the laser heats up the small vein, collapsing it and destroying it without injuring any nearby structures. Most treatments take up to 45 minutes to complete, however this varies due to the surface area being treated. Ice and a topical numbing cream may be used to promote patient comfort during the treatment, however most patients tolerate the treatment well. Although side effects are rare, as with any laser treatment the risk of skin blistering, skin breakdown, and skin discoloration can occur. Patients report an overall improvement in the appearance of the treatment area and can immediately resume work and almost all normal activities. The use of support stockings may be used to help apply pressure and decrease bruising. It must be noted that multiple treatments may be needed in some patients with extensive spider veins. Using the Deka FT hand piece, intense light reaches the skin’s deeper layers while leaving the skin’s outer layers untouched. Deka also has incorporated an integrated cooling device into the hand piece of this treatment allowing for increased patient comfort during the treatments. Using different filter head attachments, the aesthetician can select the appropriate treatment wavelength for the various types of skin care conditions. Most treatment sessions take 30 to 45 minutes with no recovery time. Patients can return to work and resume their normal skin care routine immediately. Compared to radiofrequency or laser skin rejuvenation which require topical anesthetics, IPL treatments causes little to no pain. It must be noted, however, that repeated treatments may be necessary to achieve the desired effect. For optimal results, we recommend four to six treatments, spaced three weeks apart. Side effects may include decreased or increased or pigment, or transient redness in the area that was treated. By avoiding the sun, side effects may be reduced. One of the most common procedures performed in the US today, laser hair removal is a noninvasive procedure to reduce or remove unwanted body or facial hair. Multiple treatments are usually required, commonly between 3 to 8 sessions. Age, ethnicity, medications, hormone levels and body area will effect the color, thickness, and length of the hair, which in turn will affect the efficacy of the laser treatment. The color of the hair will attract the laser energy. Because of this, patients with dark hair and light skin will be the best candidates for this procedure. Patients with no hair color or very fine hair will usually not respond well. Patients with dark skin may have more side effects. At any given time, the hair follicles will be at different stages of growth. Only the hair growing in the active growth stage with color in the shaft, will respond. Normal hair growth cycles last from 3 to 6 weeks. This is the reason why the hair removal sessions are scheduled 4 to 6 weeks apart. Some patients may respond very well, others may need additional maintenance sessions every year for optimal results. In preparation for the procedure the patient needs to shave the area the day of or the day before the treatment. (This will decrease the risks of burn to the surface of the skin). Patients will also need to avoid sun exposure immediately prior and after the procedure. Patients will need moisturizers and sunscreen lotions as well. As with any laser treatment, the main side effects can be: skin blistering, changes in the color of the skin, lack of permanent hair removal and burns. CO2 DOT Therapy (Dermal Optical Thermolysis) is an innovative new option for for the treatment of fine lines and deep wrinkles, and traumatic, surgical or acne scars. This advanced technology uses CO2 energy to create thousands of microscopic “DOT pattern” perforations in the skin while leaving the areas around each ‘dot’ intact. This process stimulates skin tightening and collagen growth. Because the laser leaves healthy tissue between the dots, the skin heals faster after treatment. Typically, only one or two treatments are needed, which makes DOT Therapy an ideal alternative to other laser resurfacing procedures. In comparison to traditional CO2 resurfacing treatments, CO2 DOT Therapy offers quick healing and manageable downtime. What issues can CO2 DOT Therapy treat? CO2 DOT Therapy can restore your skin’s tone and texture to a more youthful appearance, often in one to two treatments. How can CO2 fractional laser skin treatments help me? Microscopic dots using CO2 energy are scanned onto the skin and create columns through the skin’s layers. These columns stimulate skin tightening and collagen growth. Because the laser leaves healthy tissue between the dots, the skin heals faster after treatment. Usually only one or two treatments are required with minimal recovery time, making CO2 DOT Therapy an excellent alternative to other laser resurfacing treatments. Procedure can be customized to your skin to accurately treat specific areas. Learn more by calling 913-685-1108 today.